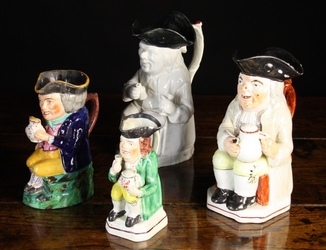 A small preview of some of the more interesting Antique Staffordshire Toby jugs coming up for sale through auction. Always check their website auction catalogue descriptive information along with condition, travel details and lot availability. 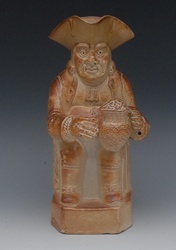 Descriptions are taken from the auction house catalogues. 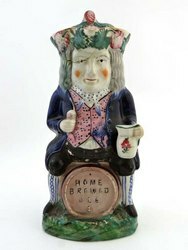 A 19th C Staffordshire pottery Toby jug sitting astride a barrel marked Home Brewed Ale. 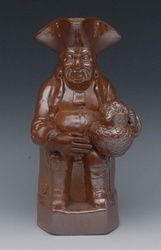 with lid to tricorn hat high 12 1/2"
19TH CENTURY TOBY JUG "THE SNUFF TAKER. 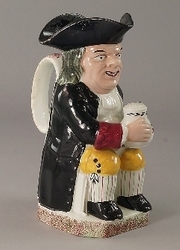 A Devenport Staffordshire Toby jug. 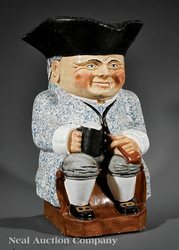 oversized Rockingham toby jug-converted to a table lamp. 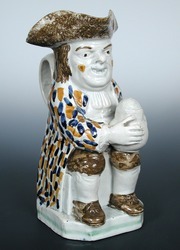 A Davenport Hearty Goodfellow pottery Toby jug. c1840. Two Staffordshire Toby jugs, an Isnic style vase, a ruby glass claret jug with pewter mounts, set of three Georgian triple ring neck mallet decanters and stoppers. 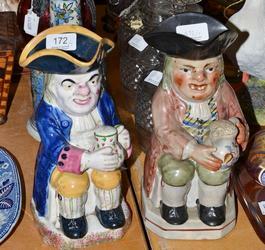 Condition Report: Toby jugs: Red jacket - heavy crazing, chip to foot, nick to rim of hat, some areas of wear to glaze. Blue jacket - heavy crazing, dirty, restored chips to rim of hat, wear to yellow rim. 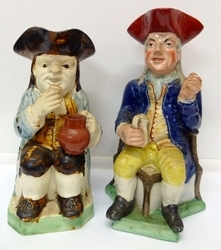 A good early 19th century Brampton-style stoneware toby jug. 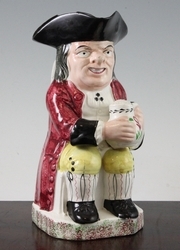 A Late 19th Century Staffordshire Toby Jug Modelled as Taking Snuff. 27cm high. 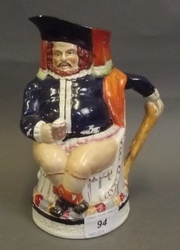 A Monumental Devonmoore Pottery Toby Jug, store advertising trade piece or window display, gilt and polychrome painted, height 22 in., width 15 in., depth 16 in. 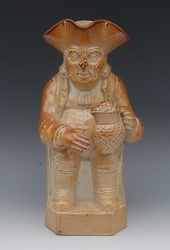 Four 19th Century Toby Jugs: A large pearlware seated 'snuff-taker' with black tricorn hat and shoes and a puce spray of foliage adorning the handle 10 ins (26 cms) in height. 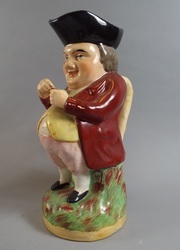 A Staffordshire Toby seated with a pipe and tankard of foaming ale wearing a lidded tricorn hat, frock coat over a plaid waistcoat and yellow breeches, 10 ins (25 cms) in height. 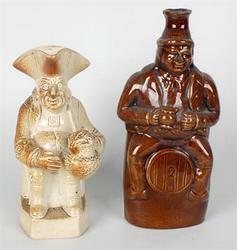 A polychrome Toby 8 ins (20 cms) high, and another 6¾ ins (17 cms) in height. 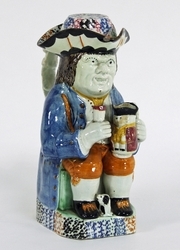 A late 18th/early 19th century Prattware Toby jug, he sits with a foaming mug of ale, his tricorn sponged brown and his coat flecked with blue and ochre, a green line around the canted square base.